As a habit, I stare into the sky afraid of what I might miss. It's weird isn't it - how it is? "Music is a bit like a card trick," says Darlia's Nathan Day. "You can make flames shoot from your hands or pull doves from a hat, but it's just a gimmick. Everyone knows it's a trick and they soon get bored of it. Simple close-up tricks aren't as flashy, but they're harder to do and keep people interested for much longer." Attend one of the Blackpool trio's live shows, and the analogy's backed up, with Nathan centre stage, casting a spell over the entire crowd. It's no accident it's happened this way. Nathan, now just out of his teens, has been plotting, planning and scheming this moment for longer than he can remember. A combination of isolation at school – his upbringing saw him excluded from many regular class activities – crippling shyness and anxiety meant he wasn't big on communication until music came into his life. "I moved around schools, and finally met Jack when we were about 10," he says of old friend and Darlia drummer Jack Bentham. "He was from a really musical family and I'd go round to his house and just be infatuated with the instruments they were all playing. I was fixated on the guitar, even though I couldn't play anything and I was forbidden from having a guitar of my own by my family." Eventually, saving paper round money, he went to his neighbourhood, snake-breeding wheeler dealer who sold him a three-quarter size electric guitar for £15. That was that. He was hooked. Hooked on the reaction his playing on both himself and other people. "I realised I could control people's feelings with what I played," he says. "That's an incredibly powerful thing." But he didn't want to start a band. Not yet. "I didn't want to be some novelty band of 15-year-olds, I wanted to be taken seriously and I knew that took time," he explains. "Most of my time was spent convincing Jack to believe me." University parted the friends, which was when Dave Williams, the band's bassist came into view. All three members of Darlia attended the same school but due to differing personalities and social groups had barely shared a conversation in their time there. Fate threw Nathan and Dave together when they'd finished their studies. They became cleaners at the school – "I wanted to leave the place, I just didn't seem able to," says Nathan. "We got fired after about six months, for just sitting around playing songs." By now Jack was back in Blackpool and Darlia was born. Local buzz erupted first, the seaside town's gossip mill going into overdrive, followed by industry rumblings, management and record label interest, plus, most importantly, a rock-solid fan base that follows them on tour. "Getting together was all so natural," says Nathan. "And even though we hadn’t spoken in three years, asking Jack to be in the band was the most obvious, simple thing in the world." Despite being together less than a year, they've already toured the country three times and released an EP. They've also got all the songs needed for their debut album. In fact, Nathan says he's got hundreds of songs written during his time mapping out a career. The album will follow later this year, with producers currently being auditioned to help capture Darlia's immense range, power and sophisticated melodic nous. "I grew up with delusions of being the biggest star in the world," he says. "Although, it's a tailored delusion. If someone thinks they're going to be the biggest star in the world, there's nothing wrong with that if it's grounded in an element of reality. "I had this belief at school where I thought the world was out to get me, but instead of just wallowing in that, I accepted whatever was thrown at me and decided that I could do something to counter it. If life does one thing, I do another back. "And I used to hear people at open mic nights talking about how they were going to make it, but there's a difference when I say it. I mean it." 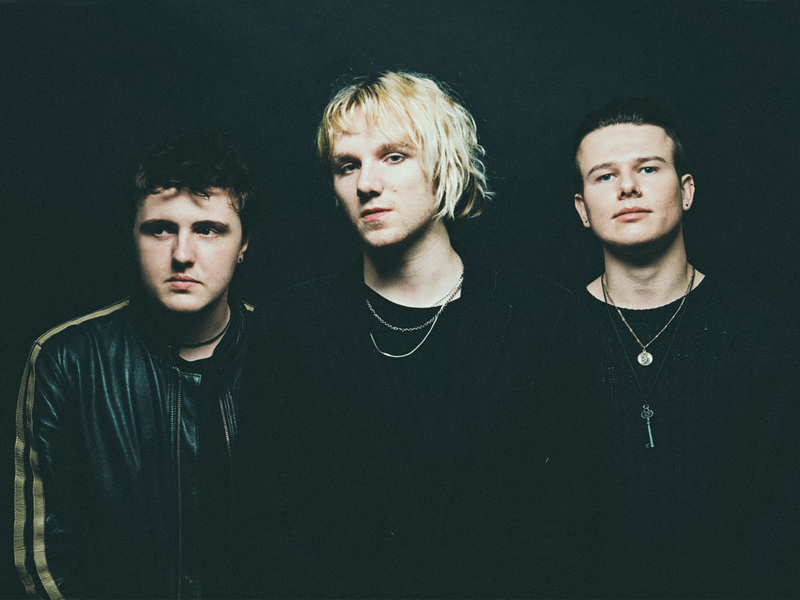 Musically, Darlia evoke early-'90s grunge, albeit a particularly British take on that most American of genres. Napalm rattles along, a bluster of crunching guitars and Jack's relentless drumming. Queen Of Hearts, meanwhile, recalls Green Day at their earliest and best. "I love the idea of my songs being really instinctive," says Nathan. "Songs that can be both ambiguous and powerful, meaning everything to whoever is listening to it. Doing that without falling into 'put hands in the air' blandness is the key – that stuff's just vague, empty nonsense – so my statements have to be more primal than that. "There's a lot of religious imagery in my lyrics, which I don't realise at the time of writing. I would argue it has nothing to do with my upbringing, but that's probably not true. There's a lot of anxiety in my lyrics too. It's better now, I can dial it down, but there were times when I couldn't move through fear." The irony of someone who suffered in such a way now fronting a band, throwing himself around stages up and down the country, isn't lost on Nathan, but in music he finally found a say what he'd been unable to for so long. "It's self-absorbed, but there's no point in it not being," he reasons. "It's such a beautiful way to communicate. I wasn't allowed to partake in so much of school, so I had all this time by myself. I'd just go and sit in the hall while the rest of the class, the rest of the school, did other things. I'd just play the piano for hours on end, not knowing what I was doing." It might seem bizarre for the frontman of a band not to listen to music, but that's the case with Nathan. Only in the past couple of years has he become aware of other bands having spent most of his life without music of any kind. He doesn't own an iPod and has no music on his phone or at home. He can't walk past a stereo playing in the street, either, through fear of the reaction it will elicit. "There's nothing else that has the same effect on me as music, it has such a hold over me. But if I hear something when I'm out and about I just get drawn into it and I can't help it. "Music says exactly what I want it to, it says everything I always wanted to but never could."